Half Herb Roasted Chicken topped with a Sherry Cremini Mushroom Cream Sauce. Served with Vegetable and Starch of the evening. Your choice of Soup or Salad. Pan Seared with choice of sauce. Served with the Vegetable and Starch of the evening. Your choice of Soup or Salad. Certified Black Angus Filet Mignon with a Chimichurri Sauce made with Parsley, Oregano, Garlic, Fresno Chiles, Red Wine Vinegar, and Extra Virgin Olive Oil. Served with the Vegetable and Starch of the evening. Your choice of Soup or Salad. In place of normal Friday dinner service Woodbridge GCC is hosting the Spring Wine Tasting & Dinner. To include over 100 fine wines to sample and Heavy Hors’ Doeuvres. The Cafe will close at 5 pm for normal dinner service. Taco Tuesday – Prices applicable with the purchase of a beverage (non-alcoholic if the order is to-go). 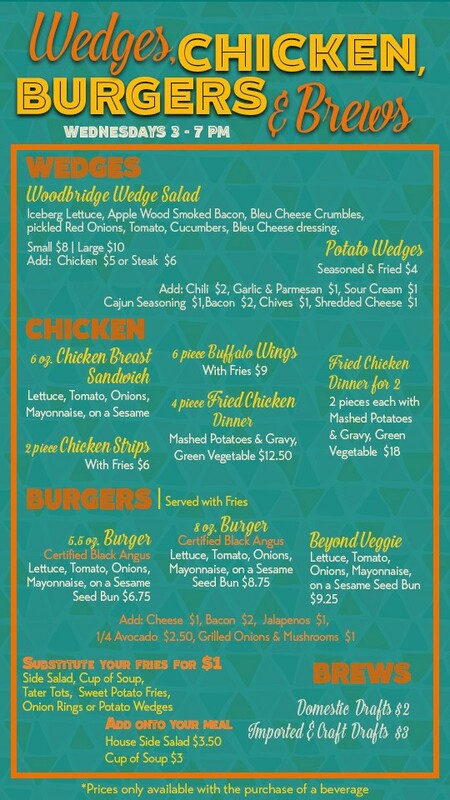 Wedges, Chicken, Burgers & Brews – Available Wednesdays beginning at 3 pm. Prices applicable with the purchase of a beverage (non-alcoholic if the order is to-go). Thursday Flip It – Members & Spouses “flip” for a chance at 50 percent off their entrees (salads & sandwiches not included). Reservations must be made by 3 pm.